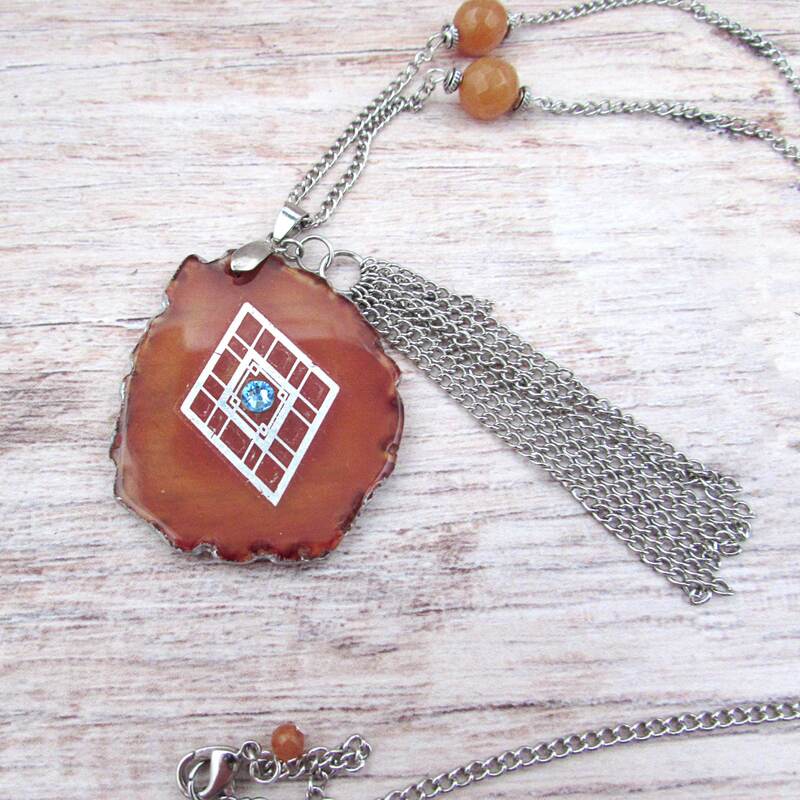 A very unique find, this womens agate slice necklace features slinky silver-plated pewter chain, mysterious faceted orange agate stones, a hand-cut chain fringe and a lovely Carnelian slice focal. A silver geometric diamond shape has been hand-applied to the stone as well as a lovely, aqua colored genuine Swarovski crystal forming an "evil eye" in the center. The edges of the stone has been hand-painted with silver leafing paint and then sealed in a clear coating. A silver plated lobster claw clasp has been added to the ends of the necklace even though the necklace is long enough to slip on. A tiny orange agate dangle has been added to the back of the necklace as well for an accent. This is a perfect necklace for your summer festival style! The necklace measures 29 inches ( cm) in length. Thank you for choosing The Feathered Elephant for your Bohemian and gemstone jewelry needs.